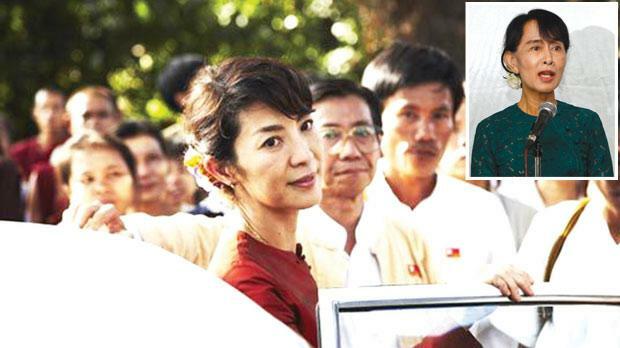 Michelle Yeoh is almost a split image of pro-democracy leader Aung San Suu Kyi (inset). The Lady reminded me of Richard Attenborough’s 1982 classic Gandhi. It’s a film that is not about being entertaining or being a perfect film but rather about making a statement of peace. The subject is an unusual choice for Luc Besson who is more known for his action and sci-fi fantasy films. However, his direction shows immense respect and admiration for the central protagonist. The lady in question is Aung San Suu Kyi, Myanmar’s pro-democracy leader, who has now been finally elected into Parliament. She was at one point one of the world’s most renowned political prisoners. She spent about 20 years of her life under house arrest as she faced off with the Burmese military regime. As Mr Attenborough’s Gandhi would have never succeeded without Ben Kingsley’s masterful performance, so too would have The Lady were it not for Michelle Yeoh. Not only does she physically resemble Ms Suu Kyi but she is poised and commanding and makes for a fitting protagonist. In the film’s prologue set in 1947, we witness the murder of Gen. Aung San, Ms Suu Kyi’s father. He had been one of Burma’s heroes for his role in the country’s liberation from Britain. Ms Suu Kyi was only three years old at the time. The film then skips to 1988 where Ms Suu Kyi is happily married to Michael Aris (David Thewlis), an Oxford professor, has two children and seems to be happy. However, when her mother becomes sick, she returns to Rangoon. There she is hit hard by the violence and chaos dominating the country. At one point the rebels seem to get what they are demanding and Gen. Ne Win (Htun Li) seems to be backing down. Ms Suu Kyi is convinced she should stay on and become the figurehead for the National League of Democracy which was starting to find its footing. She would appeal to the masses because of her father’s roots. That is when the military regime kicks in. They do not want to make her a martyr but do not want her in power. Thus she is placed under house arrest; meaning no access to telephones, media, TV or any other form of communication. Her family can only visit infrequently and are most times are kept from entering the country. The film’s script has been constructed from interviews with people that are very close to Ms Suu Kyi. We can sense the loneliness, the emotional anguish as she is torn between the love for her family and the love for her country. The French director’s lens constantly searches for Ms Yeoh, keeping her in focus and raising her on a pedestal while making us sympathise with her. The film is about peace but it is also about love and family, the ties that are built and also about dreaming of a better world.